This piece is being shared with you by Boreal Forest Citizen and Brickyard Creek community member, Dan Wilczek. After practicing law for 35 years, Dan enjoys the opportunity to do some hard science as Steve Sandstrom’s biology student. Admittedly disappointed with grades he has received to date, Dan is encouraged by Steve’s promise that extra credit projects will be offered. Most, if not all of us, have enjoyed a moment of contemplation at a favorite listening point enjoying the peaceful sound of the creek riffling over stones and gravel and the filtered light glistening on the creek’s surface. The water looks clear, but you may have wondered if the stream is healthy and what, if any, aquatic life may call our Creek home. You may have also thought about the role that our creek plays in preserving the health of Lake Superior and questioned whether run-off into our spring-fed creek could result in Brickyard Creek containing pollutants harmful to aquatic life. The importance of answering these questions for the streams and rivers that empty into Lake Superior led to the creation of the Superior Rivers Watershed Association (SRWA; formerly the Bad River Watershed Association). The mission of SRWA is to assess, maintain and improve watershed integrity. The Association changed its name in 2017 to reflect the expansion of its coverage area to 2,700 miles of streams in Bayfield, Ashland and Iron counties that feed into Lake Superior and Chequamegon Bay. One of SWRA’s projects is to regularly test rivers and streams within the watershed. 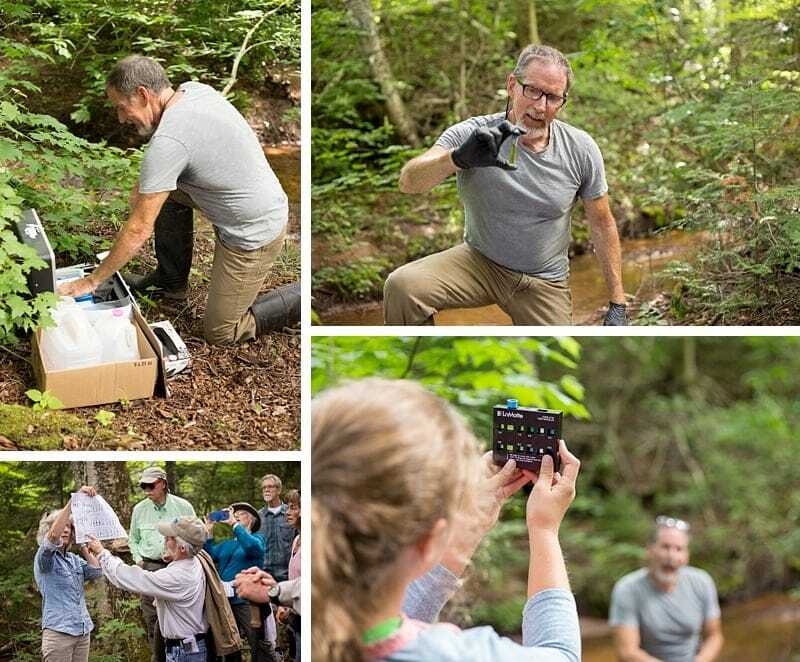 Much of this work is performed by trained “citizen scientists” who regularly test the quality of streams and rivers at 105 sites. You can learn more about the good work of the Association on their website at SuperiorRivers.org. Representatives of SRWA gave a demonstration of its testing regimen to the BYC community last summer. Steve Sandstrom and I were interested in joining the work of the Association and have been testing the water in Brickyard Creek since October 2017. The Association provides the training, materials, and equipment needed to conduct the tests. 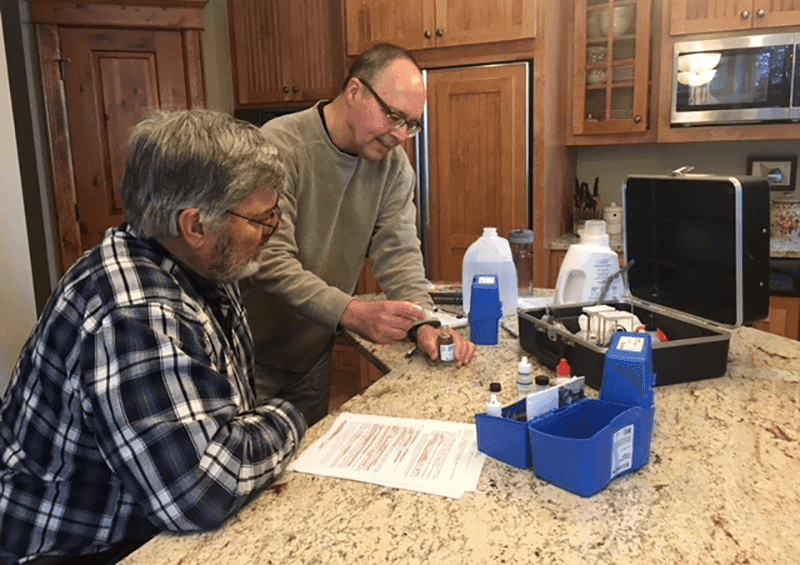 The tests provide information regarding a stream’s current water quality. The tests also establish a baseline reading of water quality so that any future detrimental changes can be identified and investigated. Protecting the water quality of the watershed is essential to protecting the health of Lake Superior. Steve and I test our creek in two ways: monthly water chemistry tests and semiannual macroinvertebrate monitoring. The Water Chemistry Tests. We draw samples from the Creek near the southern section of the Brickyard Creek Trail. The water chemistry tests evaluate water quality based on five factors: pH, dissolved oxygen, chloride, turbidity, and temperature. Dissolved oxygen is the most involved test. It is the same testing procedure used by the DNR and other agencies to test freshwater habitats. The ph value of the creek water has ranged between 7 and 7.5. Seven is considered the pH of pure water. Dissolved oxygen refers to the level of free, non-compound oxygen present in the water. It is an important parameter in assessing water quality. A dissolved oxygen level that is too low can harm aquatic life and affect water quality. Winterkill is often due to low DO. Our testing has shown dissolved oxygen levels in the Creek of between 11 and 12.4 DO mg/L. Literature reviewed indicates that salmon and trout egg development is delayed if DO levels are below 11, bluegill and perch require DO greater than 5, while carp can get by with DO as low as two. Chloride readings have ranged between 20 and 32 mg/L. Normal levels for fresh water range from between 0 and 100. At 250 mg/L water begins to taste salty. Runoff from road salt can lead to high chloride readings. The turbidity (clarity) tests have shown little, if any, difference between the clarity of distilled water and water from the Creek. Temperature is determined because it can affect the DO level. I am sure that you won’t be surprised to learn that the water is cold in winter. Macroinvertebrate Monitoring. We conducted one macroinvertebrate monitoring session in October. We chose the area below and above the bridge on the Sigurd Olson Trail. Using a net with very small holes, you jab (a vigorous scrape) ten different spots along a 100-yard stretch of the Creek. The goal is to jab in areas representative of the Creek’s features (such as gravel or sand bottom, boulders, snags (fallen trees), leaf pack and bank overhangs. With each jab, you check the net to see what insects were collected. The insects collected are rewarded by being placed in a jar of alcohol for later counting. Locating the insects is not easy; they may be classified as “macro,” but they are pretty small. Fortunately, Steve had done similar work after college and while teaching Biology and has a trained eye. We collected 58 macroinvertebrates: 15 stonefly nymphs, 16 caddisfly larvae, eight fly nymphs, 18 scuds and two aquatic worms. Two of the caddisfly larvae that we collected are extremely intolerant of polluted water, a living indicator that our creek is free of pollutants. This was also confirmed by SRWA, which evaluated the sample using the Hilsendorf Biotic Index. Our creek received the highest rating — Excellent. The results of our semiannual macroinvertebrate monitoring and monthly water chemistry tests have shown Brickyard Creek to be healthy and free of pollutants. Steve and I invite you (or anyone interested) in participating in the testing to join us. We try to do the water chemistry tests the first week of each month. Macroinvertebrate monitoring is done in April and October. Reach out to Steve Sandstrom or me if you would like to join us in Brickyard Creek water testing. This project is coordinated by the Forest and Watershed Committee. Brickyard Creek is a special place to each one of us. Members of this important committee have a multiple role and responsibility – to preserve, restore and enhance the common grounds of the BYC Community. As an association, we have collectively committed to become environmental stewards and practice a philosophy of enhancing and sustaining the uniqueness of this special place. The Forest and Watershed Committee continually strives to be the foundation for stewardship here at BYC and in partnership with the larger community of Bayfield. If you have an interest in fostering this mission, please consider becoming a member by contacting Committee Chair Steve Sandstrom or BYC Manager Jeffery Garrett.